I tried your probe anyway - unfortunately it causes a deployment error (see image). Without investigating, I'm guessing there's something in there not compatible with RT? I already log the 'states' to a log file, which is how I know if the appropriate states are being fired in each actor. Plus I log all errors to a separate log file. 2) Double checked wiring - it's fine. So I took a look at "vi.lib\drjdpowell\Messenging\ObserverRegister\ObsReg Core\ObsReg to Table.vi” which shows how to take an ObsReg Core class and represent it's data in tabular form. How can I use this to investigate the number of Observers on the subactor notifier before I send the reply? I presume this is the motive? We have one Event Observer established. Hence the message was received and no problem occurred. For sanity I removed the diagnostic code and recompiled it, and the problem is still gone. Aargh! I haven't changed a single other thing! What's going on!? And the problem has returned. No changes. This has to be a race condition. Sadly I no longer have the diagnostic code in there so I have no way to see if the Register had any Observers. I'll reintroduce the code and do some repeat testing (multiple reboots of CompactRIO). I can no longer get it to fail. With or without the code segment above looking at the register, it now always works. And I've literally changed nothing else. i don't think there can possibly be a race condition in the code itself. If you send message A then B, then they are handled A then B. Could there be a compiler bug on RT affecting either User Events or the DVR the ObsReg uses? 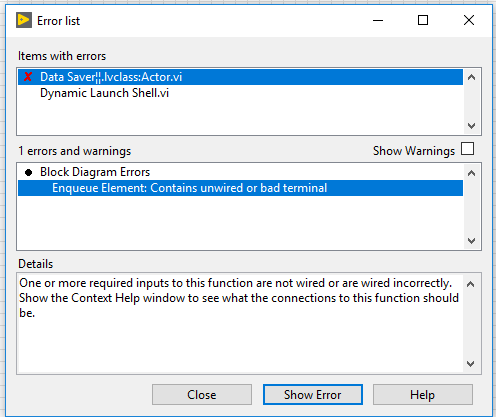 You can freely change the strictness of the reference to “Dynamic Launch Shell” if you like; so you don’t have to downgrade to an older Messenger Library version. Hello James, I am not completely sure, if this crash really is related to the send.vi of your framework (version 1.9.6.99). Have you ever encountered such a LV crash? The crash occurs after a day of runtime (dev template based), where messages are frequently send to the same actor. I not aware of such an issue caused by Messenger Library, and that subVI does nothing other than fire a User Event. Are you able to make an EXE and try that? Hello James, I tried to reproduce the error, but after a restart of the pc the error seems not to be occuring any more. Thanks for the answer and sorry for the beginner error not to test if restart would solve to problem. 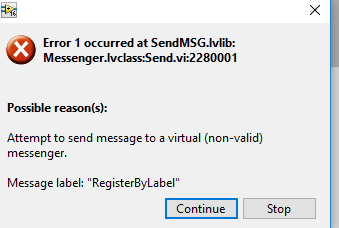 Attempt to send message to a virtual (non-valid) messenger. Not sure where to go from here... Any Ideas? That error is from when one tries to Send a message to the parent class of all Messengers. 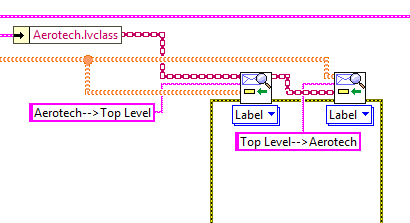 The parent class is "virtual" meaning it is an error to actually try and use it, rather than a "concrete" child class like your EventMessenger (orange wire in the image). Your Aerotech.lvclass "actor" has a Messenger inside it. If you have never "Launched" it, then it will not contain a concrete child-class Messenger and will throw that error (note: it will throw a different error if it Launched and then Shutdown for some reason). So, I think you have a bug somewhere upstream that has caused you to "drop" the address of your Aerotech actor, or to never launch it, and you are trying to send to a never-launched actor address. I will try and improve that error message to mention unlaunched actors. 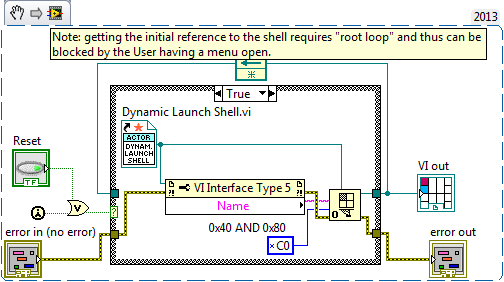 The Aerotech Actor is launched to a subpanel in the previous init steps, the actor is running in the subpanel. What sort of bug would cause the address to be dropped. How would I discover this bug, or better yet how would I go about fixing the problem? Should I re-write the Aerotech actor? Or do you think the problem may be in my Top Level Actor? My first suspicion would be you forgot to wire the newly-launched actor to your cluster (ie. you "dropped" or "lost" the address). The problem is almost certainly in your Top-Level actor. The "X" indicates an invalid address, though note that this could be a launched-then-shutdown actor address, rather than an unlaunched one. You are absolutely right, I did drop the address. For some crazy reason I didn't think I needed to return the newly launched actors wire to the cluster... Costly mistake. On various occasions I run into the problem where one of my Actors is broken and I didn't realize it (such as a Type Def needs updating, or maybe I accidentally left an Actor in an unfinished state, etc.). This causes all Actors to not be able to be dynamically launched until the bad/broken Actor is fixed. Since the Actor is dynamically launched, I don't realize this until I try running the program. 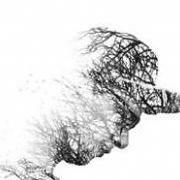 Is there a good way to figure out which Actor is broken besides going through the process of opening all Actors to find out? I use the ctrl-L shortcut key to bring up the Error List Window. Broken actor will have a red X.
Wow, so easy! I guess when the top-level level VI isn't broken I forget that there's another way to bring up the error window beside clicking the broken arrow! Hi James, I was looking through the VIs and tried searching for an answer, but I can't seem to get my head around how nested actors get triggered to shutdown when their calling actor shuts down. I saw somewhere mention of a queue references whose sole purpose was to indicate to the nested actor if the calling actor is alive, but I cannot figure out how that is implemented in the code. I understand such info is not necessary for usage of the library, but I am curious. Could you please highlight the implementation of this feature? It's an asynchronous action called "Reference Monitor", a variant of the "Address Watchdog" available on the library pallets. It's started inside "Startup type 2.vi". 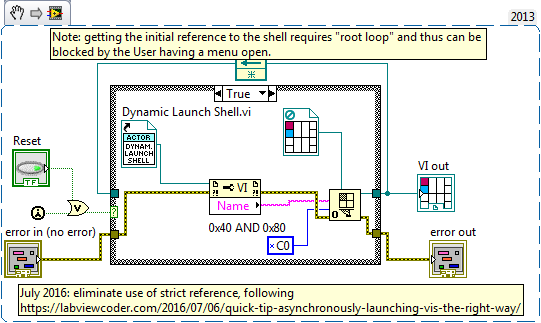 That VI exchanges messages with "Startup Handshaking.vi" (inside "Launch Actor") in order to get a Queue created in the Caller for the Reference Monitor to monitor. 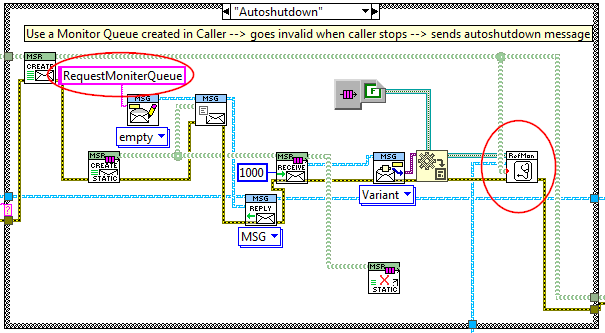 The Monitor is configured to send a shutdown message if the Queue dies. BTW, this is one of the best examples of "internal complexity to support external simplicity" in Messenger Library. Having things created by a Caller automatically clean themselves up is a major simplification, but to get this requires sophisticated internal plumbing. Holy crap you weren't kidding! That is one deep rabbit hole. I'm amazed at the internal complexity of this library. I guess you really did earn that Dr. title! Very clever solution with the asnyc call to spin-up the reference checker. Is there any reason for choosing a queue vs some other type of reference? Edited July 6, 2018 by Conner P.
I needed a reference I can wait on, and I do not know of a lower-overhead option than a queue. 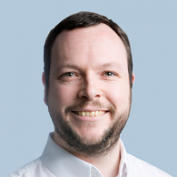 Hi James, how would you recommend making a message class for a specific data type? As a little preview I am trying to make a thread pool class which includes a manager actor and worker actor clones. Normally I would find the variant solution satisfactory, but as we discussed in my post on the NI forum, I have a high throughput application and don't want to give up speed I don't have to. My initial thought was to just make a subclass of MSG.lvclass like variantMSG.lvclass (sorry if the names aren't 100%, don't have LV with me atm), but then I discovered that the internal send and extract variant message methods DO have "abstract" parent versions within MSG.lvclass. I didn't want to go fussing with the library base classes, so instead I designed the send and extract methods of my customMSG.lvclass to accept a generic MSG object and then internally cast it to my custom child class, allowing the internal methods to do the extracting or writing. I, personally, rare!y make custom message subclasses, though it is my intention that one can use Messenger Library that way. Somewhere on LAVA is an example I made of doing AF-style Command-Pattern messages. But I generally either use variants or I create non-message object classes that I pass in messages (example: a dataset object, or job object, or fast-growing object). The later have useful lifetimes longer than one message pass. I'm not sure variants are that slow, btw, so I would benchmark before avoiding them. Edit> "fast-growing object" is some strange auto-spell correction, but I can't for the life of me tell what I was meaning to write! Ah yea, I hadn't considered using an object. But since I was planning on passing a cluster, what difference does it make if it is an object or a plain cluster? Not much in the message passing regard. But, packing the data in an object does open the door to created class methods to manipulate the data, which in turn could use the command-pattern for the ThreadPool. With that, it wouldn't be so much passing in a set of parameters and returning a separate result, but more passing the object through the ThreadPool and "pushing a button on it"-- very assembly line like in my mind. I think I just realized the potential of the command pattern. I use an object only when I'm doing a lot more than just passing data in a single message. So a "job" object might be sent to the "Worker" actor, who calls "do job", but then the completed "job" is passed on to another actor who calls methods to reads the results. Or a "data" object might pass through several actors for processing and display. If I just want to pass a loose collection of data from one actor to another then I just use a cluster. But I find it rare to do this, and my messages tend to either be a single piece of data (or array) or a tight collection of data that makes sense to be an object.